It's The Holiday Screenshot Quiz! It's impossible not to ask the question: how can you justify writing 1,000 pages about thirty-three years of a life? The answer is both intimate and grand. Stanwyck is uniquely worthy of careful attention for her impact on her industry, but also for what she stood for, for her grit and for the times she lived through, from the New York theater world of the teens and twenties through the early talkies, World War II and the years leading up to and after the studio age. She was active throughout enormous social changes and always managed to stay with the times. And yet, there was a loneliness to her. She clung to whatever family she could find, while simultaneously protecting herself from the world around her. Wilson has made Stanwyck the center of a history that includes the social, political and artistic life the goes on around her. It's as if the book is an epic mini-series and she is the star. She floats and fights in this vibrant world; you can sense its energy pulsing around her. Not many subjects could justify this kind of attention to detail. A woman as complicated as Barbara Stanwyck practically demands it. Sometimes I would become impatient with the scope of the story. Stanwyck can disappear for several pages while Wilson devotes her attention to a detail of the Roosevelt administration or a Hollywood scandal. As a whole it works though. It's a big, juicy story. Fifteen years of enthusiastic research woven into an addictive whirl of lives and events, with its subject perched on top. Barbara Stanwyck was orphaned at four, a showgirl by her teens and in a short period of time advanced to dramatic roles on the stage. Independent, tough and hardworking, she funneled the emotion of her turbulent life into passionate, moving performances. Hollywood followed, and there she allowed directors like Frank Capra to mold her rough, natural talent so that she became a screen actress of breath-taking power, drawing as much emotion from the film crew as theater audiences. The book takes the star from her rough childhood and early years on the stage, through her stifling, abusive marriage with Frank Fay and early screen stardom, to a more easygoing relationship with movie heartthrob Robert Taylor. 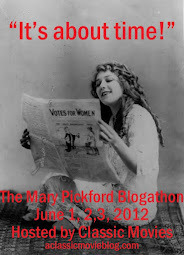 In thirty-three years she advances from poverty to wealth, obscurity to worldwide stardom. She succeeds through the force of her talent, and yet she struggles to relax and to enjoy her success. Always fighting to keep up her weight up, drinking twelve cups of coffee a day and reading through the night due to insomnia, any happiness she finds has an edge. 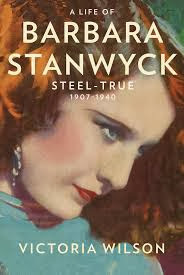 Stanwyck confounded many with the extremes of her personality, friendly and open to some, frosty and distant to others. Sometimes she'd shift from one to another with a single, baffled friend. She was often on guard. Still, she overcame the hurt and dysfunction of her early life to build many strong relationships and even occasionally grab a little fun. Steel-True ends on a tense note, with World War II ready to explode. Stanwyck has finished Remember the Night (1940), with costar Fred MacMurray, and she is preparing to work with director Frank Capra for the fifth time on Meet John Doe (1941). She's already seen enough for a lifetime, but there is so much more waiting in the years ahead. Even a partial list of films to come is enticing: The Lady Eve (1941), Double Indemnity (1944), Christmas in Connecticut (1945), The Strange Love of Martha Ivers (1946), The Furies (1950) and The Thorn Birds (1983). I don't know how I'm going to distract myself until the next volume arrives. Many thanks to Simon & Schuster for providing a review copy of the book. I got a review copy maybe three weeks ago -- I'm on page 12. I almost had a stroke when I saw it was 1000 pages and then had another one when I saw the words "Volume One." Crickey! I've been feeling very stupid lately. Anything more challenging than a Nero Wolfe mystery makes my head hurt. It's not stupid to be overwhelmed by a 1000 page book! It's actually about 860 pages of text. Fortunately I knew about the length before I received it, but it was still a shock to see it. I also got stuck on the early pages, but then I got into the flow of it and curiosity kept me turning pages. Keep going. It's worth it!